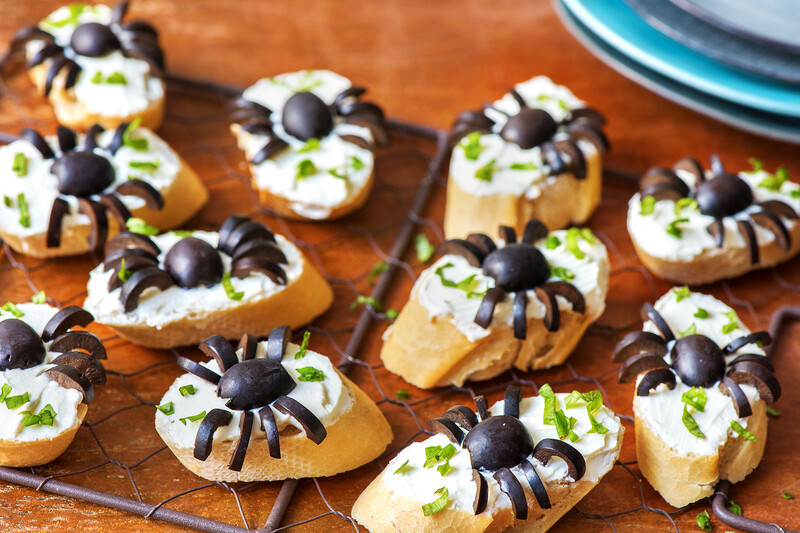 These healthy Halloween treats are scary good. But making them? Now that’s not scary at all. The festive recipes are simple enough for anyone to conquer. All it takes is a little creativity, a whole lot of imagination, and a BIG appetite. Remember last week when we shared the best apples for baking, snacking, and cooking? We told you that Granny Smiths were best when cooked, tossed into salads, and blended into juices. Well, turns out we forgot to include another very important use of this tart and slightly sour fruit: carved into monsters! Quarter each apple, then cut the middles out to create a mouth. Slather the inside with a smear of creamy peanut butter, stick sunflower seed teeth into the mouth, add a sliced strawberry tongue, and stick 1-2 sugar eyes onto the “head” with a dollop of peanut butter. 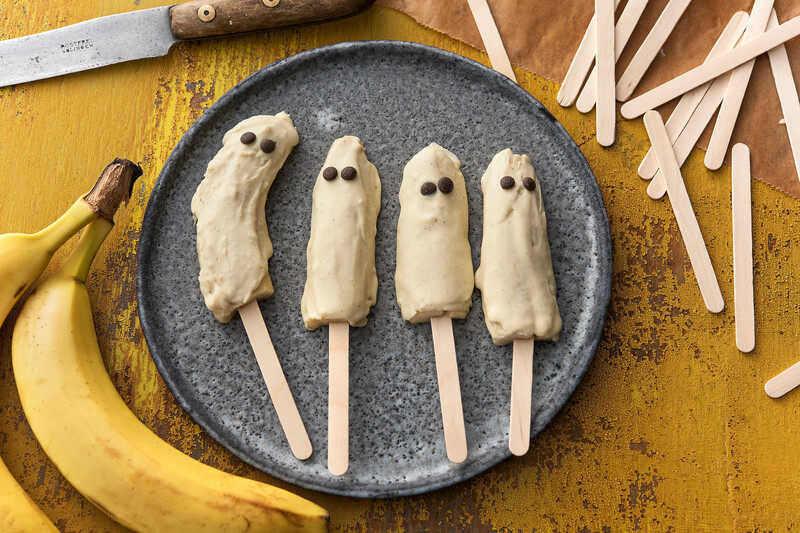 These bananas are pale as a ghost thanks to a thick coating of white chocolate. Cut the fruit in half lengthwise, then in half to make four quarters. Insert a popsicle stick into the banana’s wider end, place on parchment paper, and freeze 24 hours. Add 100g white chocolate to a microwave safe bowl and microwave in 30 second increments, stirring until it’s smooth. Dip the frozen bananas into the chocolate and place back on the parchment paper. Add dark chocolate chips as eyes while the white chocolate is still warm. Place back in the freezer for 2 hours. We contemplated calling this a vomiting watermelon, but we’re not sure that would have been the most appetizing idea. Then again, he is throwing up watermelon and pineapple, which are two of our favorite fruits. So let’s be real: whatever you call it, we’re going to eat it. Once you’ve carved your fair share of pumpkins and gotten the stringy bright orange flesh all over, take a stab at apples… literally. Use a knife to carve out eyes, a nose, and creepy smile. Then, take a bite with the spooky face staring back…we dare you. And then, when you’ve carved all the pumpkins and apples in sight, get started on the citrus. Scoop out the insides, but don’t throw them away! You could always blend them into a juice or smoothie. 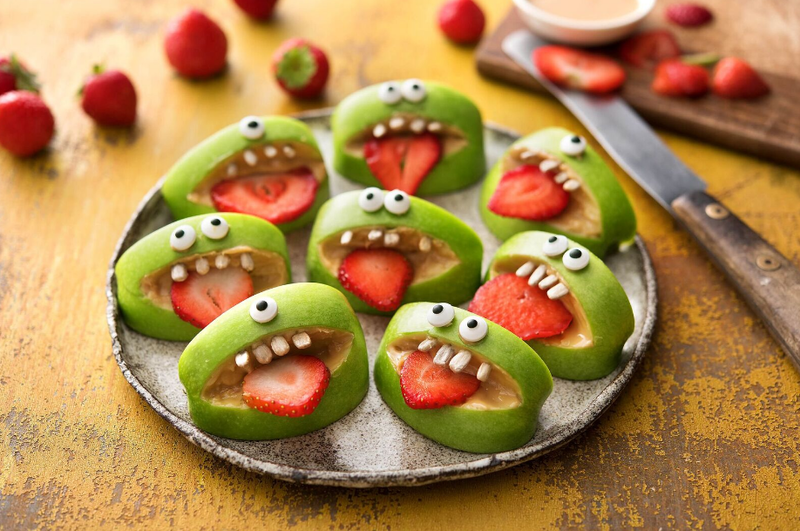 Then, carve eerie faces and overload the insides with berries, apples, kiwis, and whatever else you have on hand. Ewwwwww spiders. But also, YUM. These creepy toasts are made by slathering a layer of either goat cheese or cream cheese on thick slices of toasted French baguette. Then, one half a black olive is placed in the center as the body while 4 smaller slices are placed on either side as legs. Sprinkle with finely chopped basil, and you’re done! 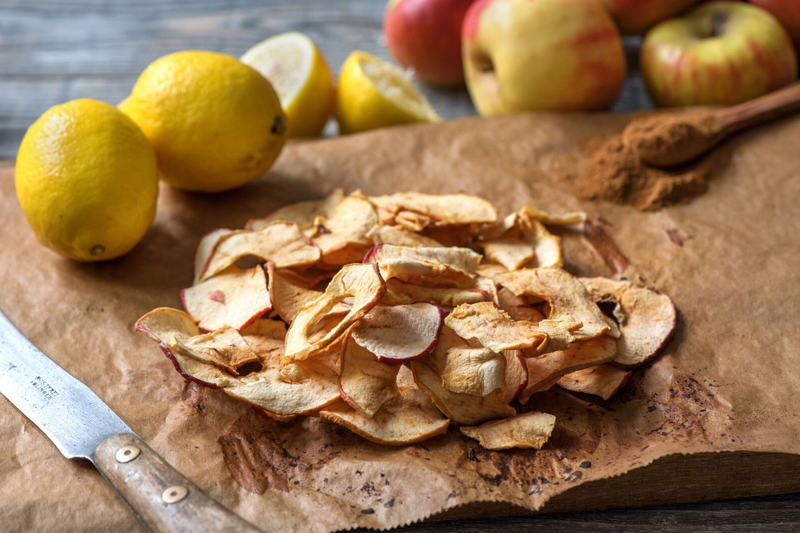 Who needs potato chips when cinnamon apple chips are available? Preheat your oven to 200 degrees Fahrenheit, line a baking sheet with parchment paper, and carefully slice apples into super thin pieces. (Bust out your mandoline if you have one.) Remove any seeds and immediately dip the slices into lemon juice. Transfer to baking sheet, sprinkle with cinnamon, and bake until apples are dehydrated and slightly crunchy, about 2 hours, flipping halfway through. Bonus: your kitchen will smell like apple pie while these wonders are baking away. So this one isn’t technically spooky (well, I guess the last one wasn’t either), but we couldn’t resist. After all, what are you going to do with all those pumpkins? Quiche, my friends. Quiche. Preheat oven to 375 degrees Fahrenheit. Toss diced pumpkin with olive oil, salt, and pepper. Bake until soft, about 30 minutes. While pumpkin cooks, prepare crust by mixing all ingredients in a bowl. Press dough into tart pan (preferably with a removable base) rubbed with coconut oil. Bake until slightly golden brown, about 20 minutes. Clean mushrooms with a damp dish towel before cutting into thick slices. Peel and thinly slice shallots. Heat a drizzle of oil in a pan over medium heat. Add shallots, sage leaves, and mushrooms. Season with salt and pepper and cook until mushrooms are golden brown and soft, 6-7 minutes. 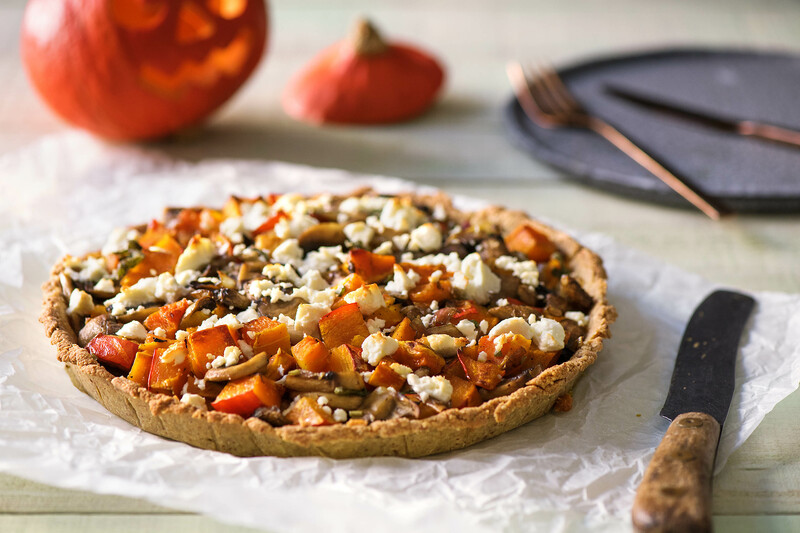 Remove tart crust and pumpkin from oven. Add pumpkin to pan with mushrooms and toss to combine. Beat eggs in a bowl with salt and pepper. Stir in half of the pumpkin mushroom mixture and pour into the crust. Cover with the rest of the mixture, sprinkle with cheese, and bake at 350 degrees until eggs are solid, 40-45 minutes. It’s impossible to talk about Halloween without mentioning sugar, which is why we asked our Dietitian, Rebecca, to explain the differences between natural and added sources of the sweet stuff. 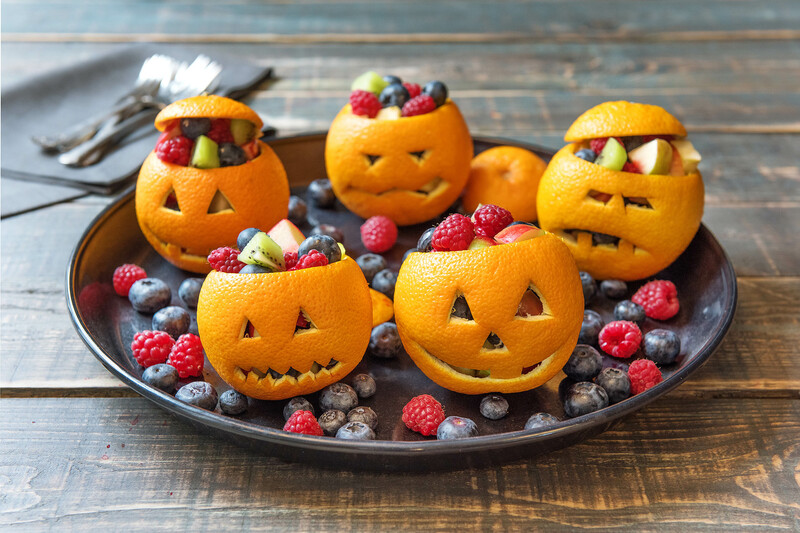 The apple monsters and jack-o-oranges are so adorable…makes me wish I had kids to cook them for! 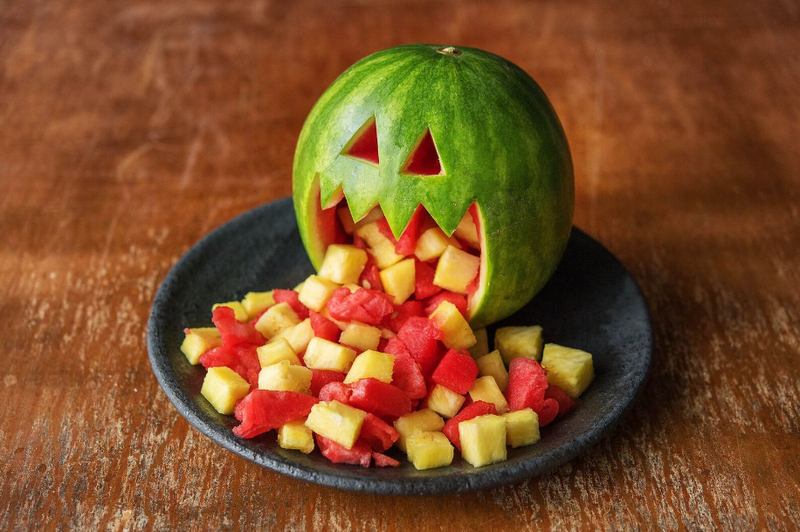 Great fresh food Halloween ideas!